$100,000 Spring into CASH at Canadiandollarbingo.com! Register and join them starting this April 1st for your chance to take part in the $100,000 Spring into CA$H extravaganza. You will have the chance to win over $5,000 in GUARANTEED CASH EVERY week, three chances to hit a $10,000 Jackpot EVERY day, the opportunity to win the $1,000 CASH Grand Prize plus over $3,000 in EXTRA Cash and Prizes this month! So step into the Main Room and be rewarded with bird songs, a display of flower games bursting into colorful life and the welcome sight of animal themed games not seen since last year, to win your share, as each special pattern holds fixed jackpots of up to $250 CASH! 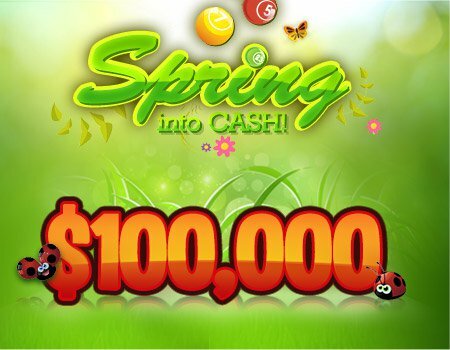 Every time you win one of the ‘Spring into Cash’ patterns, you will get 1 point into the weekly ranking for a chance to win extra prizes and $1,000 grand prize entries.That´s right, a single win on one of the ‘Spring into Cash’ Patterns could win you $1,000 CASH!!!! No worries! If Bingo is not your thing they still have you covered. To enter, just play any of the famous casino games from April 1st to April 30th and you are on your way to winning. On May 3rd , 2017, they will combine all weekly rankings (Casino & Bingo) and randomly select the $1,000 Grand prize winner. Remember the more entries you collect, the higher the chances of winning. As the weather warms up, jackpots will grow just in time for spring! Join www.Canadiandollarbingo.com in their '$100,000 Cash into Spring Contest this April 2017. New members get a $50 FREE trial bonus and new depositors an incredible 1000% Welcome Bonus package. Register NOW! This entry was posted in Blog on Apr 12, 2017 by Canadian Dollar Bingo.